State Broadcaster YLE poll: Finns Party rising with 2% bump in approval……. – The Tundra Tabloids……. State Broadcaster YLE poll: Finns Party rising with 2% bump in approval……. Support for Prime Minister Juha Sipilä’s Centre Party fell to its lowest level in six years in Yle’s latest political barometer. As parliamentary elections draw closer, a fresh Yle poll shines light on a political landscape in upheaval. The biggest loser in the survey conducted between 14 January and 5 February has been the conservative National Coalition Party (NCP), which saw voter approval slip to 17.3 percent, down 2.3 percentage points from the last poll. The last time voter backing for the NCP reached this level was back in 2016, when Petteri Orpo had just taken over the reins from ex-premier Alexander Stubb as party leader. Pollster Taloustutkimus speculated that the party has suffered as a result of heated debate over the quality of care at senior care homes, with the party unable to articulate a clear position on minimum nurse quotients per patient. Taloustutkimus research director Tuomo Turja said that declining approval for the party among women and the elderly in particular confirm the suspicion. The NCP’s adverse showing signals good news for the largest opposition group, the Social Democratic Party (SDP), which will likely compete with the NCP to field a prime minister following April’s general election, the pollster noted. The SDP did see a slight erosion in support of 1.1 percentage points to 20.1 percent, but still retained the top spot in the survey. At the same time, the NCP has not been able to continue narrowing the gap between the top two parties, as it had been doing late last year. Turja said that the elder care debate and the discussion about nursing quotas have been a boon for the SDP, with the party using its union roots to dominate the staffing debate in recent weeks. However with chair Antti Rinne on extended sick leave, the party currently has no de facto prime ministerial candidate. First deputy chair Sanna Marin has been filling in for Rinne in the interim. 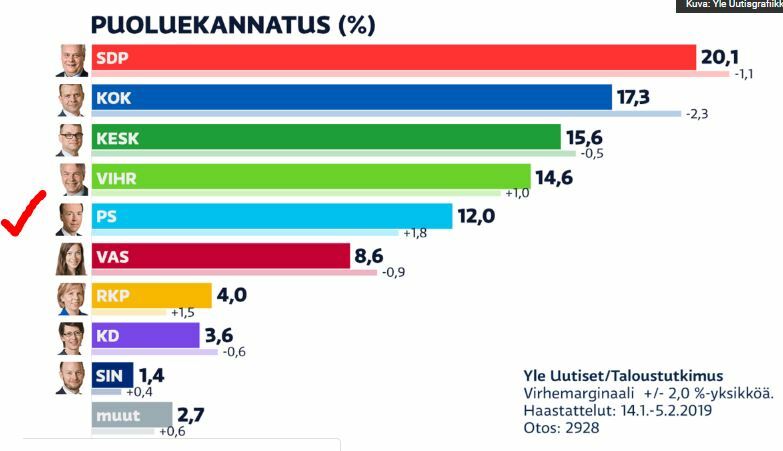 The immigration-sceptic Finns Party posted the biggest gains in this poll, continuing a trend of gathering increased support from voters. With 12 percent voter approval, the party is closing in on its best performance among voters, which occurred back in 2015 when it grabbed 15 percent of the ballot in the general election. However as a government party, it saw voters abandon it as the number of asylum seekers arriving in Finland increased, the administration introduced austerity policies and workers’ rights weakened. The party splintered in June 2017 when current chair Jussi Halla-aho ousted Timo Soini as party leader. Turja noted that the Finns Party was not leaching support from other parties, and speculated that the voters who had abandoned it and remained uncommitted to any party were now returning to the fold. Its performance may have also received a boost from sustained reporting on suspicions of child sexual abuse in Oulu, he added. The opposition Greens also saw voter support inch up by one percentage point to 14.6 in the latest survey, reinforcing their fourth-place status. The party’s fortunes have improved since last autumn, when political veteran Pekka Haavisto took over from Touko Aalto as party chair. “With the Greens, we can clearly see that they are getting support from other parties, especially the SDP and the NCP,” Turja commented. The Greens are nipping at the heels of Prime Minister Juha Sipilä‘s Centre Party in third place with 15.6 percent voter approval. The last time backing for the Centre was this low was during summer 2012, when Sipilä assumed the mantle of party chair. Its current level of support is also lower than its haul in the 2011 parliamentary elections, when just 15.8 percent of voters cast ballots for the Centre. The Left Alliance also slipped nearly a full percentage point to 8.6 percent voter backing. Turja said its supporters were likely also heading over to the Green camp. Among the small parties, the Swedish Peoples’ Party posted four percent voter approval, while the Christian Democrats and government party the Blue Reform (which split off from the Finns Party) attracted 3.6 and 1.4 percent of voter support respectively. Previous Post Previous Post Mordechai Kedar: The US-Taliban peace agreement result of Obama\s advisors’ refusal to understand why Afghanistan remained dysfunctional after years of US efforts……. Next Post Next Post Tommy Robinson is coming to Finland to speak on Muslim ‘Grooming Gangs’ at preview of asylum seeker/refugee documentary film…….